We all want to be loved and we all seek the truest, purest love, but when our hearts are broken (seemingly) beyond repair, it can seem unattainable and something of a fairy tale. The love the world creates is vain and often selfish - what we need is the Love of the Father. Lacey Sturm shares with complete honesty why true love is often times painful-but oh so worth it/ She gives examples from her own relationships past and present how our broken hearts can be healed, and how her orphaned heart learned to trust again. 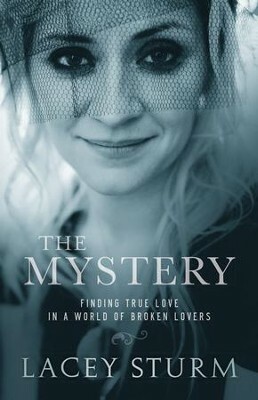 To be honest I didn't know too much about Lacey Sturm before reading The Mystery. I knew she use to be part of the rock band Flyleaf and now sings her on own and that a pastor had something to do with her story. I'd only heard one of Flyleaf's songs on the radio and since I'm not a fan of more harder rock (unless we're talking Skillet), I just never pursued learning more about her backstory even though something about it intrigued me. However, I was excited when I saw BarkerBooks offering this book for free in exchange for a review, and I took the offer knowing that her story was probably highly inspiring and something I'd need just about now. I was so right! Lacey Sturm speaks with a raw, often times heart-breaking honesty, sharing her beautiful life's story about coming from a broken world into the loving arms of Jesus. Her old life couldn't really be called pretty. She struggled to find true love. She longed for the arms of a Father. Her heart's cry is something I'm sure we can all relate to. And The Mystery is just what a memoir should be-a telling of someone's life but also what the Lord has done. We see the messy, her inner struggles, her depressed spirit, and we also see the beautiful in this messed up world. I liked that. A lot. Relationships are not sustained through singular or random moments. They are carved out in the splintered beauty of the everyday, one day stacked on another. I felt inspired. I felt that Lacy was open to sharing her pain as well as her joys. The writing style is also beautiful and easy to read. It's not a theological book, but a real-life story. The author also shares messages to us the readers from people she's known in her life such as Kory Cooper from Skillet, Lacye's husband, and her little sister. I highly recommend this book to anyone. A great read I couldn't speak enough about one I finished the last chapter! I got this book free from BakerBooks in exchange for a review. I love her too which has inspired me to now listen to a lot of her music. ♥ If you get the book, be sure and tell me what you think!